By 1960 the scientific community began observing an ever increasing explosion in the literature embrac­ ing the many facets of industrial microbiology. Many of the so-called traditional areas were being replaced by more modern provocative channels of endeavor. It was about this time that excellent review-type annual publications, such as Advances in Applied Microbiology, Progress in Industrial Microbiology and Developments in Industrial Microbiology emerged reporting the ex­ citing new work. It was soon, thereafter, that the Division of Microbial Chemistry shed its probationary status to become a bona fide unit of the American Chemi­ cal Society. A rash of new applied microbiological v vi FOREWORD textbooks arrived on the scene. The number of journals reporting the day-to-day scientific achievements also burgeoned. Early in my industrial career, I found it impera­ tive to devise a "workable" key to the ever increasing volume of literature that was emerging. 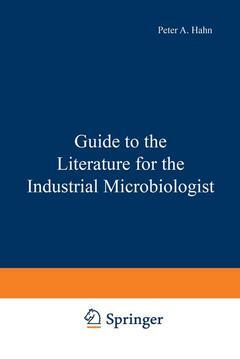 This I com­ piled over the years on voluminous stacks of file cards which have in essence been reprinted here as "my" Guide to the Literature for the Industrial Microbiologist. The Guide has, indeed, served me well and through it, one can readily ascertain the state of the art of any of the many specialized subjects of industrial micro­ biology. Logically, one would first consult recent textbooks to obtain an overview of the subject being searched. Section I Industrial Microbiological Textbooks.- Section II A Key to the Review Literature in Industrial Microbiology.- Section III Microbiological Journals and Abstract Services.- Section IV Meetings and Courses.